Cats love to get their claws into things. By nature, their claws are specifically designed to catch their food, defend themselves and their territory. While small cats are now domesticated and are predominantly kept indoors, their desire to bring out their claws remains. In fact, it is crucial that indoor cats continue to utilise their nature urge to scratch in order maintain good health, physically and psychologically. This is when the humble scratching post can be your greatest ally in the quest to save your furniture and keep your cat entertained. With a plethora of designs that vary in complexity and function available on the market, nothing has been able to replace the simple but classic cat scratching post. The genius design fits the job description and does wonders to keep your cat mentally and physically active, while distractıng them from destroying your furniture. Like a lot of pet paraphernalia, a simple scratching post can also be quite expensive. They are however, simple to make. You may have some old carpets or fabric lying about the house. Perhaps you like to colour coordinate your furniture or personalise and match everything you own? 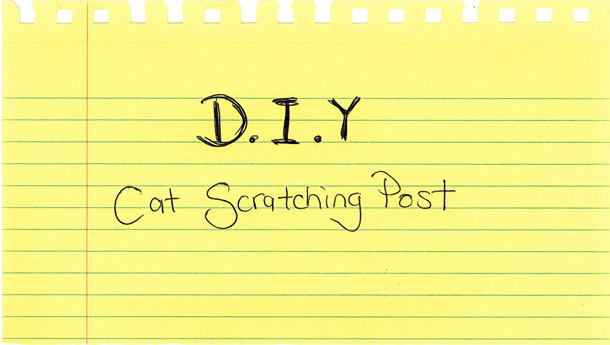 Why not free the DIY champion in you this weekend and make your own cat scratching post? Use this chance to revel in the rewards of making something your feline friend will love. Please note: this DIY session is not suitable for young children. The ‘Classic’ design will make those of you who shy away from any kind of handy work feel like Tim Allen once the job is done. You can choose from a double or single post structure. 2 x thick cardboard/plastic cylinders around 40 cm long and 9 cm in diameter. You can increase the length should you want a longer scratching pole. Step 1: Lay a piece of wood on a piece of foam. Allow for a couple of centimetres of the foam to exceed the length of the wood- these will soon be used to pad the edges. Repeat this step with the second set of wood and foam. Step 2: To create the base of the cat pole, select one set of wood and foam. Arrange where you would like each cylinder to go. Once you’ve done this, trace the cylinders and cut them out of the foam using your scissors. Try to make sure the cylinders are evenly spaced from each other and the parameters of the foam. Step 3: Place the cylinders into the indents and make sure they fit in well. Step 4: Lay out one piece of your material on the table. You can be creative and keep in mind the base and roof of the structure can be different coloured materials and textures. Then place the foam with cut out cylinders on top of the material followed by the piece of plywood. Fold the material like you would a present and make sure to pull it back and down until the material is taught and ready to be stapled down using your staple gun. What you are looking at now is the bottom of the structure. You can stick rubber here to stop the structure from sliding or scratching your floor. Step 5: Turn over the completed base. Feel around for the two cylinder indents you have made. Place the cylinders over these and trace around them using a permanent marker. Then using a pair of scissors or Stanley knife cut out two circles from your fabric. Step 6: Remember to have plugged in your hot glue gun. When it is ready apply the hot glue generously to the circumference of the circle you have cut out into the fabric and the base of your cylinders before placing them in the indents. Let it dry for a few minutes and check that the cylinders are secure. Step 7: Now to the roof of the structure. Repeat the same steps used to make your base- layering your material, first foam then plywood. Lay your material out placing foam and wood on top then fold the material back and use a staple gun to hold them down. Please note, you will not need to cut out circles in the foam for the roof of your structure. Step 8: With a permanent marker, trace the circumference of the cylinder and mark the centre. With a Stanley knife, cut from the centre of the circle to the outer rim, repeat this several times to create an opening. Repeat this step for the second cylinder. Step 9: Place a generous amount of glue on the rim of the cylinder and the opening on you have just made. When you are ready, line the openings with the top of the cylinders. Let it set for a few minutes until the structure is stable. Step 10: Finally, it is time to wrap the rope around the cylinder posts. Try to source a thick piece of rope – these are durable and require less time to wrap around the cylinders. Before you get out the glue gun, it is recommended that you measure the length of rope by wrapping it around the cylinder prior to gluing. Once you have done that and starting from the bottom of the cylinder, firstly apply hot glue liberally the base of the cylinder and place down your rope. Continue to alternate between the glue and rope. Step 11: Allow for the glue to set. It is best to road test your cat post as humanly possible to make sure it is sturdy prior to your feline friend.